Forward-thinking weight management programs utilize accurate body composition and metabolic assessments to address the unique requirements of a person’s physiology. With a BOD POD body composition (Fat and Fat-Free Mass) analysis, users can create tailored fitness and nutrition programs, as well as track changes in fat and muscle mass over time. The BOD POD is the world’s only Air Displacement Plethysmography system that determines body composition in adults and children. In comparison to other body composition assessment methods, the BOD POD’s air displacement method has eliminated the radiation of Dual Energy X-Ray Absorptiometry (DXA) as well as the difficulties associated with underwater submersion in hydrostatic weighing. This is why the BOD POD is considered the practical Gold Standard for body composition assessment. The BOD POD is completely non-invasive, making it especially suitable for frequent, longitudinal tracking of body composition and metabolic changes over time. 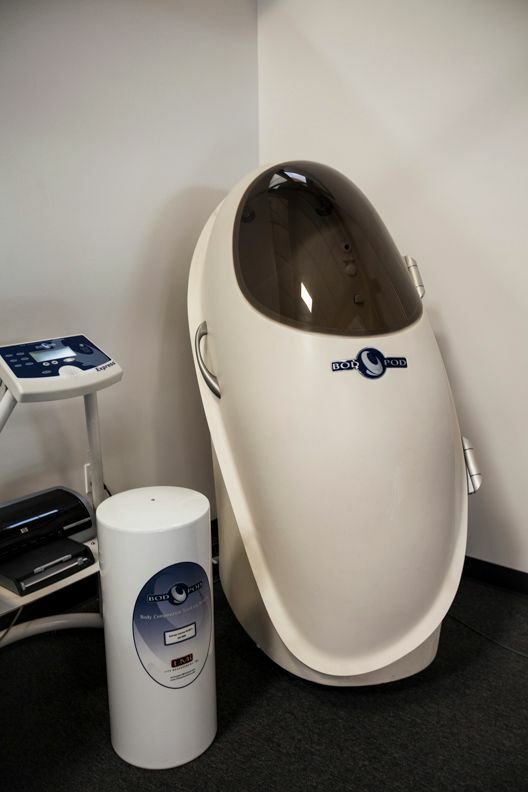 The BOD POD uses the principles of whole-body densitometry to determine body composition. This technique relies on a mass measurement from a highly accurate scale (provided) and a volume measurement from the BOD POD chamber. Once body density is determined (Density = Mass/Volume), the BOD POD predicts Thoracic Gas Volume (TGV) and then uses known (or user-customized) densitometric equations to calculate percent Fat and Fat-Free Mass. The accuracy of the BOD POD has been shown to be very high against reference techniques in a number of research publications. No yoga pants or long compression clothing! The smaller/shorter the clothing, the better the readings will be, as the BOD POD can not disregard the volume of clothing. How do I sign up for a BOD POD session? 1. PURCHASE: BOD POD sessions are $35 per visit (FREE for members); please purchase online. 2. SCHEDULE: Call (512)338-4448 at least 24 hours in advance to schedule your session. ***Please note, in order to prevent no call/no shows, all clients must purchase a session before being scheduled. Failure to show up or call to reschedule before your session will result in your forfeiture of the purchased session, and no refund will be provided.